When exercising, your heart pumps blood throughout your body at a greater rate as your muscles demand extra oxygen. Some of that blood flows through the little capillaries inside the nose itself. It doesn't take much to damage these capillaries. If you're generally sensitive to nosebleeds, you can find that you experience many more nosebleeds after exercising than normal. A nosebleed takes place when the tiny blood vessels in the soft internal lining of your nose rupture. This rupture can cause a slight trickle of blood or a fairly strong gush until the wound closes. Most nosebleeds stop in about 10 minutes. When your body is warm, blood tends to flow near the skin surface via capillaries. The heat generated while exercising, particularly on a hot day, is enough to increase your chances of a nosebleed. Running in dry conditions or breathing heavily through your nose can take some of the moisture from your nasal cavity. Nosebleeds are more likely to occur when it's dry inside the nose. 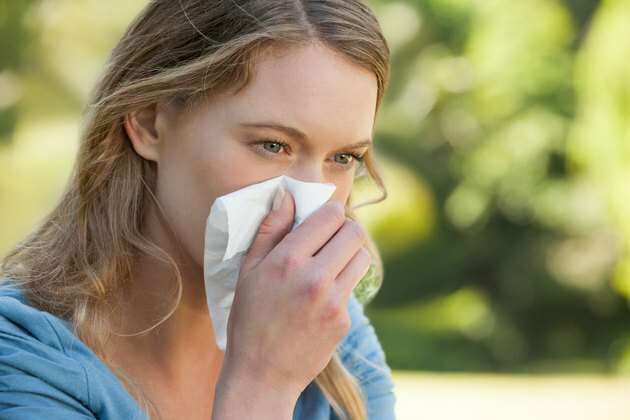 Therefore, rubbing your nose or sneezing after exercise, when the capillaries are dry and sensitive, may be enough to trigger a nosebleed. Keeping well hydrated during exercise can help keep your throat and nasal cavity moist. The Washington University Sinus Institute notes high altitudes can also play a role in nosebleeds. If convenient, opt to exercise in a low-altitude area. For example, if you live in a mountainous area, take jogs in the valley rather than partially up the mountain. High blood pressure, or hypertension, can trigger nosebleeds in some situations. Hypertension increases the pressure inside your blood vessels. Combined with exercise, this can put a big strain on your arteries, veins and capillaries. The strain can be great enough to cause vessels to burst in your nose and cause a nosebleed. Another possible trigger is the use of blood-thinning medications, such as warfarin. This can increase the chance of nosebleeds in general and after exercise in particular. Although nosebleeds rarely require a visit to the doctor, in certain situations, medical attention is necessary. If your nosebleed after exercise is the result of a blow to the head, such as after a charge in football or fall during basketball, then you should see a doctor immediately, according to the American Institute for Preventive Medicine. Similarly, if the nosebleed is at the back of your nose and running into your throat, visit a doctor as soon as you can.